While I haven’t given up on finishing all of the story quests with my Mage, Kae, I did need to take a break since I’ve gotten into a part that requires high-end gear which I don’t have yet and I was starting to feel a little bored with logging in to do dailies and then look around for dungeon instances. So I decided to work on my stable of alts. Once I got all three out of the starter instance, I then went back and started working on getting each one to twenty. For right now, at least, I’m trying to keep all three within a few levels of one another. This is partly so I can keep all of the content straight and partly so I don’t pick a favorite and let the others languish. Rotating through three different Callings is interesting, especially since I have two roles setup on the Rogue, so it’s more like playing four different classes. The Rogue seems to chew through content much faster, followed by the Cleric and then the Warrior. Still, the Warrior is a lot of fun to play, the sound effects when swinging a two-handed hammer are very satisfying. Right now, playing alts is keeping me motivated to login every night and keeping the game fun. I would like to get all three to 50, but I’m not quite ready to make that a goal. I’ve never level capped more than one character in a game, because I’m usually so attached to my main that I don’t spend the time on alts. While I still consider Kae my main, I’m not sure that I’m as attached to him as I am my main’s in other games. Maybe it’s the role/soul system? Since I can switch the style of play at the touch of a button, there’s a part of the character’s identity that’s more fluid in Rift than it is in other games. Unlike GC, I’m looking forward to getting my alts into Stonefield. Freemarch is nice but I find it a bit bland as far as the landscape goes. Trion committed their first real misstep this weekend. The big River of Souls world event started with a big two week ramp up and ended with a single event that lasted less than an hour on Saturday afternoon. Phase two was a single instance of multiple bosses spawning in each zone followed by phase three which was in-game cutscene introducing the new raid instance. I spent quite a bit of time with the dailies and looking into the lore behind Alsbeth, the River of Souls, and the Plane of Death. I was also at the level cap early, which never happens. So I was really looking forward into experiencing the event. Unfortunately I was out of town doing family stuff this weekend, so I wasn’t even one of the people stuck in an eight hour queue. Originally, I wasn’t to worried about missing anything. I figured that the event would a least last the weekend and I’d be able to login on Sunday evening and catch up with a little work. It never occurred to me that the event would only run once, since the entire build up phase was repeating rift invasions. This event was especially frustrating because of Trion’s history of good decisions until now. They did a great job of running their betas. They had a smooth launch, if not perfect, and they impressed me with how well they handled their account security problems a few weeks ago. So given all of that, why did they think it was a good idea to follow up a huge two weeks long (even if it was only planned to be one) build up with a short one hour (or less on some servers) one time only event? It just doesn’t make sense. By Saturday night, Scott Hartsman has a follow up post where he tries to do some damage control. Like Trion’s done before with other issues, they’re giving out from free items and awarding the event achievements to everyone who’s a subscriber. That’s a nice way of saying sorry. For me though it wasn’t about the loot, it was about getting to be online and experience the content, and that’s gone. To put it another way, getting a t-shirt from Disney World is nice but I’d much rather ride Space Mountain. Reading through Scott’s post, he talks about how their ambition got the better of them, but I don’t agree with that. The event itself sounds like it was fine, the problem was that it only happened once. The queues and the lag were all a consequence of motivating the entire population of every server to login at the same time, which was exacerbated by bringing the servers down shortly before the event and compressing the login rush even further. Had the even been scheduled to happen every two to three hours during the course of the weekend, I don’t think they would’ve had nearly the same problems. There still would’ve been the issue with Phase Three only taking place in Stillmoor which locks out any players under level 45 or so, but at least two-thirds of the event would’ve been accessible. I still logged in Sunday evening and had some fun. I’m not upset or planning to quit over this, but I don’t see myself investing quite as much time or interest in the next event. They’re saying the right things now, but I need to see if they can follow that with actions. Yay 50! Uhhh what now? 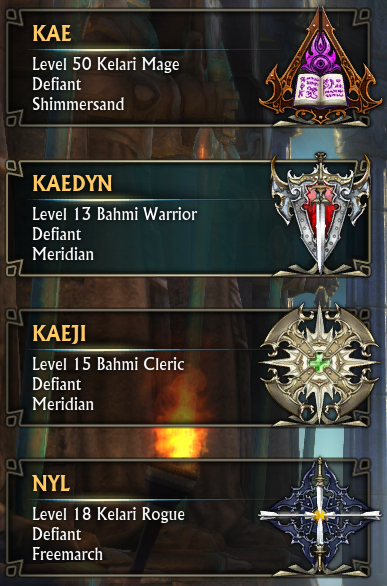 My Defiant Mage Kae reached level 50 in Rift yesterday. Actually, I could’ve done it on Saturday night but there were hardly no guildies on, and I though why waste the big level 50 achievement notice if no one’s around to see it. Of course hitting the level cap in a game isn’t new for me, but I am very pleased to have done it so quickly. Even more surprising to me is I’m the first level 50 Mage in the guild. 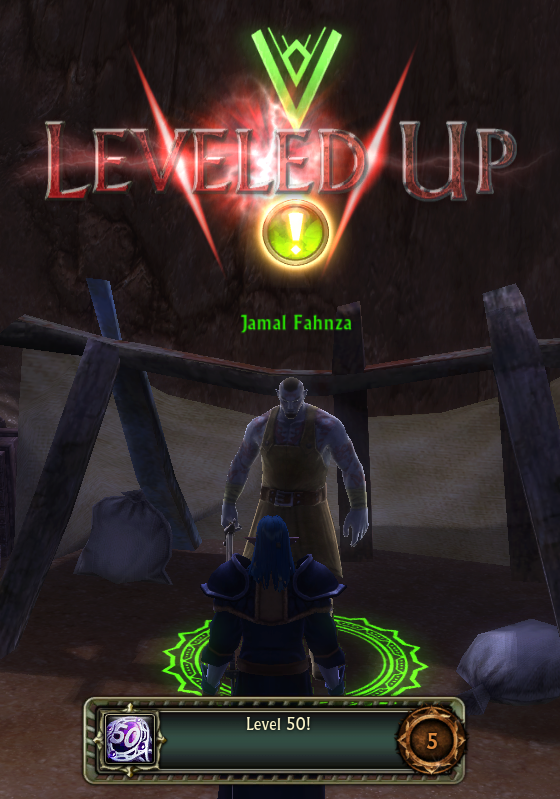 I mentioned briefly why I thought I’d leveled so quickly, but I wanted to add to it a bit. First I want to mention that I don’t think this game is any shorter than the rest of the current crop of MMOs. As a comparison, my played time in STO at Vice Admiral 1 or level 51 was about three and a half days while my play time in Rift is 6 days, 2 hours, and 47 minutes. Having an active guild has definitely played a role. I know there’s people to chat with every night when I pop in, and I’m more likely to stay online longer each night. Game design is also important. I didn’t hit any dead spots. Most games have some flat areas on the leveling curve or gaps where all of the quests are suddenly too high. At that point I’m stuck grinding mobs, which I did in EQ and don’t enjoy. Rift didn’t have any dead spots that I noticed, at least on the Defiant side of the content and since I was leveling as a glass canon, I figure that’s a pretty representative example. Lastly, having a completely new setting to explore really got my wanderer’s impulses firing. Even as fast as I leveled, I spent quite a bit of time wandering around zones. I will admit that part of that was because there are achievements for doing it, but only part. One of my favorite things to do in these games is see something interesting in the distance and then go to see it. Usually this involves climbing mountain peaks, but sometimes it’s just getting to the otherside of a forest or following a stream to see where it goes or exploring a cave to see how deep it is and if there’s a named mob hiding inside. I don’t know the answer to that. If history is any guide, I’ll roll an alt with the intention of going through the game a second time and lose interest after a week. But the game has surprised me once by dominating my attention for the first month, so maybe I’ll get a second character to the cap. I do have a lot to do with my mage still: crafting, world event, PvP instances, and dungeons. Oh, and there’s a few story quests I haven’t finished yet and I need to know what happens with Uriel and Kira. I’m getting near the end of the leveling curve. Even into the 30s it was possible to get roughly a level a day, but around the mid-40s it dropped to about half a level a day. Even with the slower pace, I’m not feeling any kind of grind though because of all of the different activities available. There’s crafting dailies, quests available in three different zones, the world event dailies, and Warfront PvP. Kae reached level 48 tonight and if all goes he’ll be 50 before the weekend is over. This will be the fastest I’ve ever gotten to the level cap in an MMO. It’s not been any easier than any other current MMOs to level, but I’ve just been playing more consistently and for longer periods. The game has been very well designed, I’ve not run into any dead spots in the PvE game. There are always quests available for my character’s level, and in the later levels there are more quests than I need and multiple zones to go to. Aside from the game design, being in Circle of Trust has also made a difference. Knowing that there are always people online to chat with and do dungeon or rift runs gives me incentive to login every night. 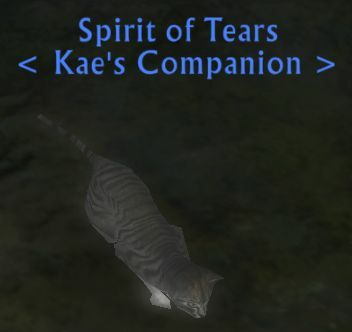 I finished the Critter Tears collection and received the Spirit of Tears reward, which looks like a ghostly cat. I was pretty lucky in that it only took me four or five tries per animal to get tears, I’ve heard from some players that have had really bad luck and had to kills dozens. 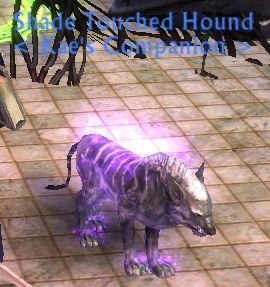 I’m more of a dog person than a cat person though, so I was also happy to collect enough Otherworldly Sourcestone from the River of Souls event to get a Shade Touched Hound. It cost one hundred of the sourcestones, which didn’t take too long since the four dailies each yield ten (or they do now, it was increased in a recent patch). I’ve also picked up the odd sourcestone from closing death rifts as well, but I’ve only gotten a few at a time that way. I missed the first couple of days of the event, so it’s only been since Friday that I started seriously running these quests, and so far they are still fun. The next stage starts in the 9th so I’m sure I’ll be ready for something different by then. It’s a small server after all. Telara usually feels like a pretty large place, but it’s started to get smaller. I say this because while I was in Shimmersand hunting for rifts and saw a Death Rift pop. As I rode up the trail to the rift and joined the public group, I found myself with none other than Mr. And Mrs. MMOGC. Pretty funny that I randomly run into guildies like that. Now that I’ve gotten the hang of it, I’m really enjoying being able to swap roles depending on the situation. Usually I run around in my Stormcaller/Elementalistl PvE solo build, which has been working out excellently. Anytime I end up in a public group of more than two others, I swap over to my Chloromancer/Warlock and get a little more practice at healing. Switching mental gears from a DPS mindset to a support/healing mindset is tricky, especially without the helpful fiction if logging out to swap characters. It’s very fun though and very handy in situations where you suddenly find that a change in strategy or tactics are needed.